Behind the scenes of the Shalit negotiations – the Palestinian version: Hezbollah tried to weigh in on the negotiations meant to secure the release of kidnapped IDF soldier Gilad Shalit, Ynet learned on Saturday. In June 2006, about one week after Shalit was abducted by Gaza terrorists in a cross-border raid near the Kerem Shalom crossing, Hamas Politburo headquarters in Damascus received a top secret report from Hezbollah, which included the Shiite group's recommendations on how best to negotiate a prisoner exchange deal with Israel, given the "strategic asset" the Islamist group had in its possession. The communiqué was delivered two years after a prisoner swap between Israel and Hezbollah took place. The 2004 exchange saw the remains of three IDF soldiers killed in a cross-border raid on the Israel-Lebanon border, as well as former IDF officer Elhanan Tannenbaum, who was held in Hezbollah captivity for nearly three years, returned to Israel in exchange for 401 Palestinian prisoners and the remains of 60 Hezbollah operatives. Prior to the Mount Dov deal, Hezbollah had negotiated three prisoner swaps with Israel, in 1991, 1996 and 1998. Just two weeks after the communiqué was delivered Hezbollah conducted yet another cross-border raid, abducting IDF soldiers Eldad Regev and Ehud Goldwasser. Their remains were returned to Israel in 2008, in exchange for five living Hezbollah operatives, including arch-terrorist Samir Kuntar, and the remains of 190 of the group's combatants. Details of the secret report became available as the Palestinians' ambiguity over the events which led to the finalizing of the Shalit deal began dissipating. Oh Hamas' part, the lengthy, five-year negotiations were shrouded with zealously-maintained secrecy and laced with measured amounts of psychological warfare; but since news of the deal broke out – and despite vows by Shalit's captors to "never reveal" the true reality of his confinement – more and more details depicting Hamas' view of the talks have begun emerging. In the early stages after the abduction, Hamas' leadership decided that only six top officials would take part – and be privy to – the negotiations with Israel: Five politburo members and one officer from the Izz al-Din al-Qassam Brigades, Hamas' military wing. Hamas made their initial demand for the release of 1,400 prisoners public, but from that point on the negotiations, and especially the identity of the prisoners whose release was sought, were kept secret. Hamas viewed Hezbollah's recommendation as their dogma, and the Shiite group's "negotiation tactics" had a great impact on Hamas' dealings with Israel over the past five years. 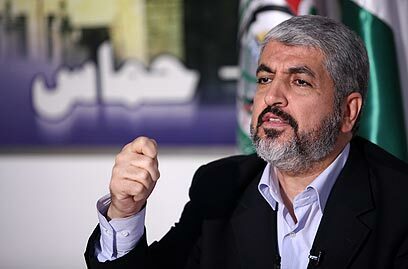 In 2009, Hamas decided to trim the negotiation team down to four: Deputy Hamas Politburo Chief Dr. Mousa Abu Marzouk, Hamas' Lebanon delegate Osama Hamdan, top Politburo delegate in Gaza Mahmoud al-Zahar and Ahmed Jabari, head of the Izz al-Din al-Qassam Brigades. According to Palestinian sources, German Intelligence Chief Gerhard Konrad assumed the role of mediator at the time and held his fisrt meeting with the Hamas team at al-Zahar's Gaza home. This was when Israel's demand to expel those it defined as "heavyweight prisoners" first came to light. 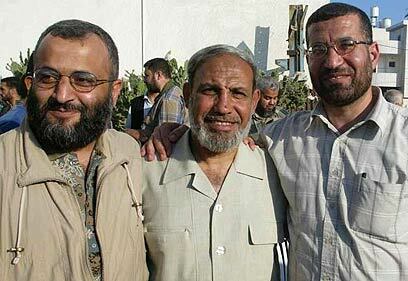 As the negotiations dragged on, al-Zahar and Jabari decided to consult with top Hamas operatives jailed in Israel. To their surprise, they prisoners – all of whom are Izz al-Din al-Qassam Brigades operatives – demanded that Hamas' leadership broker a deal even if they themselves were excluded from it. By this point – and faced with Hamas' constant rejection of prisoner exchange outlines presented to its leaders, who adamantly claimed that the proposals favored the Israeli position – Konrad had despaired and resigned from his position as mediator. The negotiation's prospects may have seemed bleak, but it was the change in position demonstrated by Hamas prisoners that eventually gave the negotiations the necessary push. Another push came in the form of the collapse of the Mubarak regime in Egypt: Hamas was distrustful of Cairo's mediation attempts in the past, declaring that Mubarak was biased against Hamas interest; but was willing to accept them now, as it viewed the new chiefs of the Egyptian Intelligence Services as much more "Hamas-friendly." Egypt's new rulers, eager to rehabilitate Cairo's rattled position as a key regional player, reclaimed their position as mediator in March 2011 and employed what Hamas officials described as "a totally different approach" than Konrad's, which they said eventually facilitated the deal. Regardless of the details revealed by Gaza sources, the Popular Resistance Committees, one of the terror groups which took an active part in Shalit's abduction, vowed that the true details of the IDF soldier's captivity will never be revealed. "The resistance went to extreme lengths to ensure that Shalit never saw his captures," a Gaza source told Ynet, adding that Shalit will not be able to recognize the place where he was held, either. The statement contradicted a previous one by the PRC, which stated that the group would release a video documenting Shalit's time in captivity, after the prisoner exchange is completed. The group insisted at the time that the video "will show that he was treated well and with respect, as demanded by the Islamic dogma." See all talkbacks "'Hezbollah instructed Hamas on Shalit talks'"